The Evil Mutant master of magnetism, Magneto is the arch-enemy of the X-Men. With his sleek and shiny Magnetron, Magneto can fire metallic disks at his enemies, the Mutant Super Heroes. Hidden magne. . . 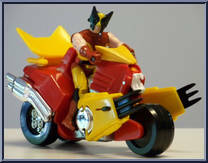 Already the X-Men's greatest fighter, Wolverine is even more powerful with his three-wheelin' Mutantcycle. Retractable claws and pop-wheelie action speed him into battle. A Power Pedal activates a t. . .